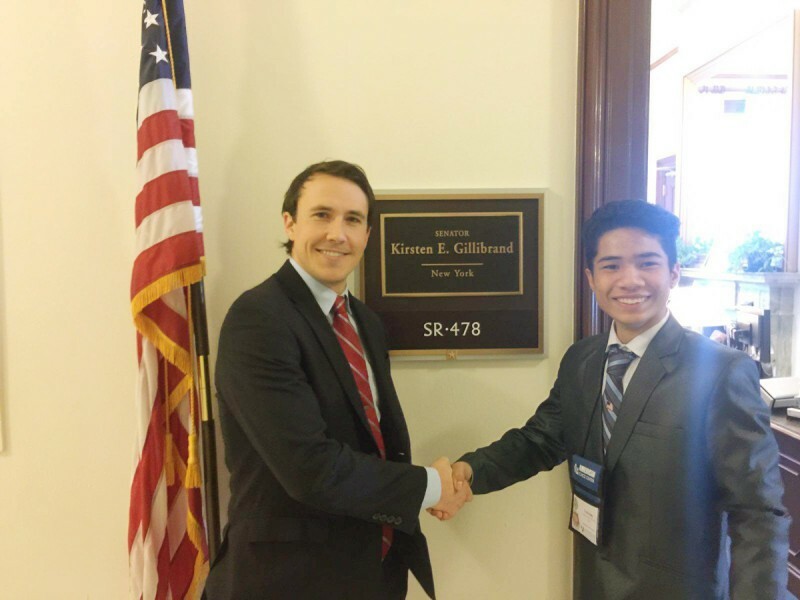 Farooq Alam (15) a student from Manipur with US Senator Kirsten E Gillibrand. IMPHAL, MARCH 3 (MExN): A 15 years old student from Imphal, Manipur, Farooq Alam, who is presently studying at 11th Standard (Arts) in Olean High School, New York, has been selected for a workshop called “Civic Education Week” programme conducted by AFS (American Field Service) from March 1 to 7. He is an alumnus student of Jamia Millia Islamia University, New Delhi and was the topper of Jamia in his 10th examination in the year 2015 and thereafter has been at the Olean High School, New York State, USA to continue his study from 11th Standard through YES Fellowship. It is a workshop programme held in the White House, Washington D.C for a week, to give awareness to the students on how the American government machinery works and their overall administrative role, sightseeing in Washington D.C. and public places of US government. This workshop is funded by the Department of State: Bureau of Educational and Cultural Affairs. The students are being taken from New York to Washington D.C. and given opportunities to meet and discuss with the State of Representatives and the Senators of a particular State of America where the students are placed in the same for a week. Furthermore, the students are being taken to Capitol Building, Supreme Court of USA, House of Representatives Building, Senate Building, etc. From among 40 countries that applicants applied for this workshop programme, Farooq Alam was selected as top 13th rank holder from the New York State, where only 100 candidates were to be selected by the AFS from different schools and colleges from different countries around the world. The selection process was made through an Essay with a topic “Political or social problem of the applicant’s country” where Farooq Alam wrote prioritizing Poverty and Unemployment in India and secured 13th position. Presently, he is at Washington D.C. and also had a meeting with Representative of New York State, Tom Reed (RE-2437) and Senator, Kirsten E. Gillibrand (SR-478).